Juwaan Williams had an impressive high school career, with 38 touchdowns and 1,569 total yards rushing, averaging 8.5 yards per carry. 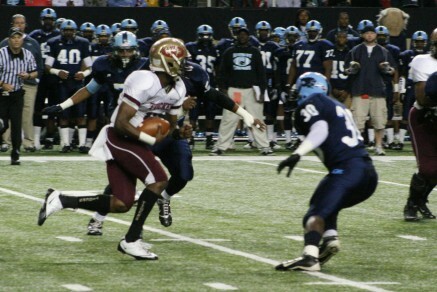 As a junior, the 6’0″ 185 pound quarterback led his Tucker, Georgia, team to a state AAAAA Football Championship. While Williams’ team was not able to repeat during his senior year, losing to the topped ranked team in the state in the final seconds of the quarterfinal, it wasn’t for a lack of effort on Juwaan Williams’ part. In his final game for the Tucker Tigers, Juwaan Williams scored three touchdowns on runs of 11, 16 and 23 yards. Last week Williams announced that he will join the Oregon Ducks, choosing Oregon over Notre Dame and Vanderbilt. Juwaan is an excellent student and desires to pursue a pre-med path of study once he gets to Oregon. In August 2012 Juwaan Williams discussed with Chad Simmons of Fox Sports Net the fact that he was being recruited by Notre Dame, Florida State and Vanderbilt as a receiver. Williams recounted his conversation with Oregon coach John Neal about how, as a receiver, Oregon saw him being a slot receiver; someone they would look to get the ball to quickly so he could use his running skills. Defense was not discussed in the interview and it is not really clear if Oregon planned to use Williams on the defensive side of the ball. Juwaan did make it clear that while receiver was his favored position, he was willing to play defense as well. It does now appear that Oregon has recruited Williams to play defense. In that case the likely spot for Williams would be at the free safety position. 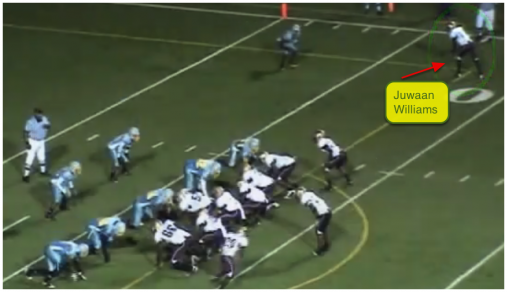 While Juwaan did play defense for the Tucker Tigers, the available highlight film consists almost exclusively of his work at the quarterback and receiver positions. On that film we see what I suspect are two factors that won over the Oregon coaches: decisive and tenacious play. As an Oregon football safety his decisive nature and football intelligence should give Juwaan Williams a chance to thrive. A free safety, more than most positions, requires a quick read of what the other teams offense is doing. The best safeties often seem as if they know what the offense is doing before anyone else and react appropriately. One of the few defensive highlights shows Williams covering a receiver in the slot. As the receiver comes towards him, Williams, without hesitation, breaks off coverage and sprints toward the middle of the field to take out a crossing receiver as the ball arrives. 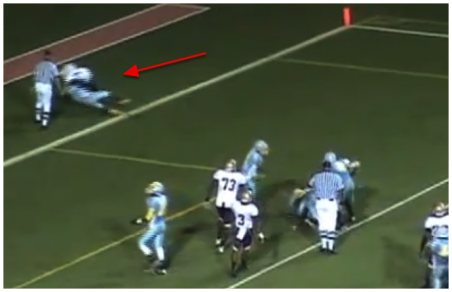 It is as if he recognized the play before the pass was made. We used to see this kind of play with John Boyett and it is this football intelligence and decisiveness that makes a safety stand out. Without doubt, his extensive experience at the quarterback position has increased his defensive awareness. Williams tenaciousness might best be shown by the series of photos below. This first photo shows Juwaan Williams at the top of the screen lined up as a receiver. 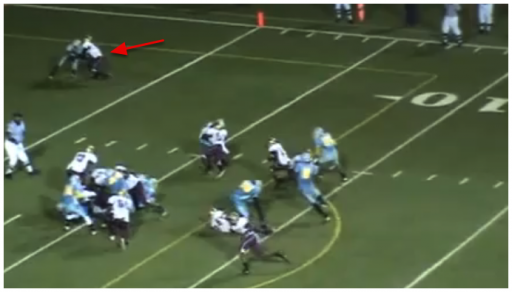 As the ball is snapped, Williams slants in to block the defender knowing the play is coming to his side. 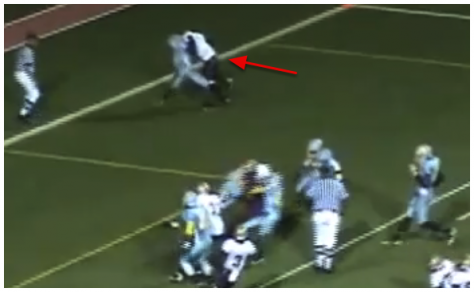 Not only does he engage the defender, he stays with the play until his opponent is blocked completely out of the endzone. Finally putting the defender on his back. We may not know everything about Juwaan Williams, but we can be pretty safe in assuming that whatever position he plays for the Oregon Ducks he will bring a decisive, intelligent and tenacious attitude to the table.